fogbound.net v. 3.0 » When purchased iTunes songs get removed. When purchased iTunes songs get removed. It was Sunday night, and I was passing the time by making a playlist in iTunes. 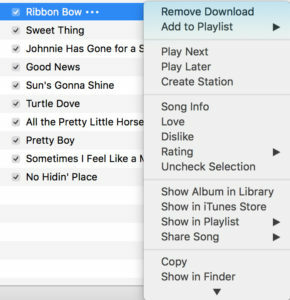 Due to the famous user-centric Apple user interface as exemplified by iTunes, the contextual menu that appears for a given song has “Remove Download” right next to the “Add to Playlist” submenu. Naturally, since deletion is something that you’ll want to do in a super streamlined fashion, there’s no confirmation if you accidentally mis-mouse onto the remove option. Which is what happened to me last night as I tried to add Elmerlee Thomas’ amazing rendition of “All the Pretty Little Horses” to a playlist. Boom. Track is gone! Hey, no problem, simply re-download, right? Ha. No such luck. I get the highly useful “Unable to access at this time, try again later” error message “err = 2059”. So I try again the next day. No good. So no worries. I’m obsessive about backups. I restore the .m4a file from backups. Sadly, iTunes happily ignores it, and says “nope, gotta download this file.” Trying to download, of course, gives the same annoying error. The web suggests I look in my iTunes purchase history via the account tab, and re-download from there. Some believe there is a special magic that causes that download link to work differently than the one in the track listing area. Although I chanted the sacred “by the blessed ghost of Steve please work” mantra, this was also unsuccessful — but not for the reason I expected. The reason this was unsuccessful was due to the album not even showing up in my purchase history. Within iTunes, I viewed information from the other tracks to confirm that it was an iTunes purchase. That’s when I get into a chat session with Apple Support. After reiterating details, the Apple Support person reported they could not find the track in question. Did I say I’m obsessive about backups? I’m obsessive to packrattish levels. I found the original email receipt from when I purchased the album, lo these many years ago. I recited Order ID and Document Number to Apple Support. “Upon reviewing my resources, I found that content provider has removed the album from the iTunes Store. Hence you are unable to re-download it from past purchases,” quoth support. “How can I restore from backups?” I asked. I’m obsessive about backups! The instructions given were the ones that had failed earlier. After suggesting I repurchase the album (which we had just resolved was no longer available), Support basically told me I was out of luck. But behold, I found a solution, which I hereby share with the world! The key is in how you restore a track. If you just restore it into the directory where it had previously been, iTunes doesn’t update the metadata and still thinks it’s been removed. Instead, restore the .m4a file to some other location like your desktop, then drag it into iTunes. That will update the metadata, and — glory be — your track will be restored. Be careful with your mousing, because iTunes hates you and wants to hurt you deeply. Have no faith in the re-download-ability of anything ever. Support will tell you to spend more money if it will get you to go away.